At the bottom of the tallest building in Reykjavik, Iceland, there’s a place called Hamborgarafabrikkan (which is ‘Hamburger Factory’ in English), and I know what you’re thinking… Doesn’t sound very vegan, does it? 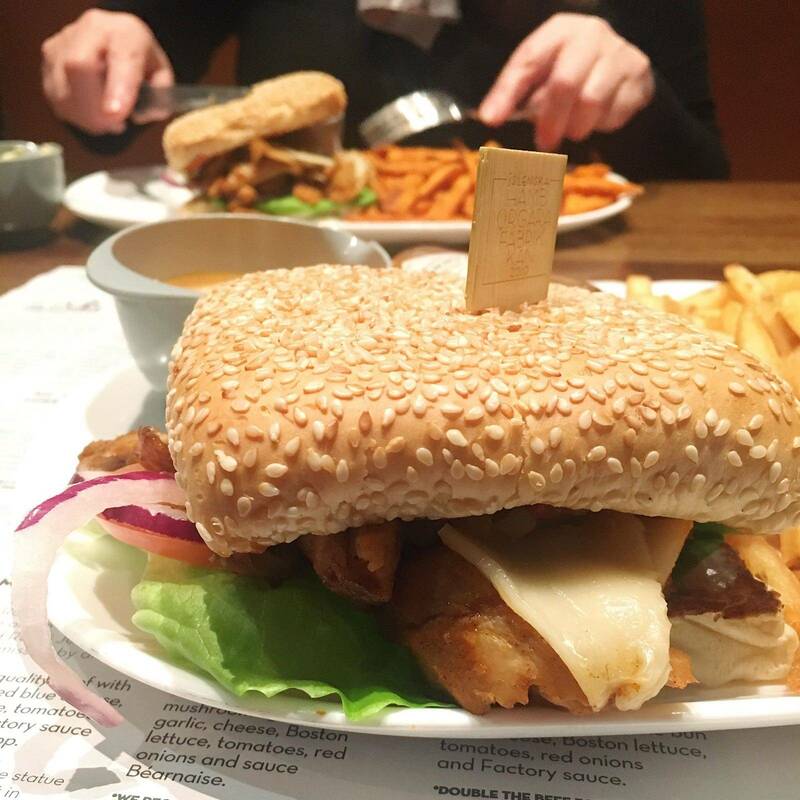 Well thanks to the lovely Leigh (foxandfeatherblog.com) I found out that not only do they serve Vegan burgers in Iceland, the Vegan burgers are filled with Oumph! (which you may remember I blogged about, not too long ago), and jeeez they were good… But I’m getting ahead of myself! If you follow me on instagram, you’ll probably know I recently got back from a dream trip to Iceland with my mum (soz about the ~3 mins of insta story video per day, but I just had to document everything). 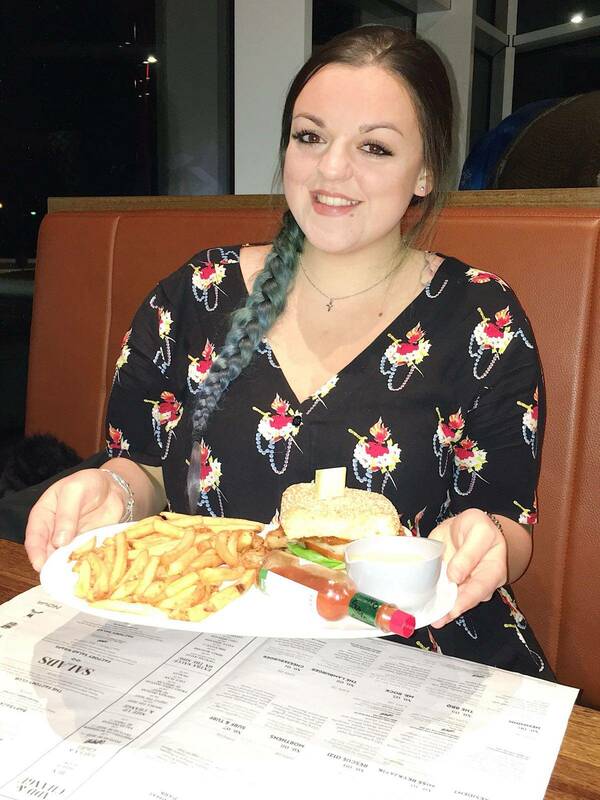 Whilst I was there I was super lucky that Hamborgarafabrikkan invited me to try out their Vegan burgers so I could tell everyone back home all about them! On arrival the staff were friendly and seated us quickly, it was a Tuesday evening around 8pm and not too busy which was quite nice, having recently landed, left our bags at the hotel and gone straight there! They had English menus on hand for us and all the options we could eat were clearly labelled. However for any questions I did have, our waitress was so knowledgeable and happy to help. 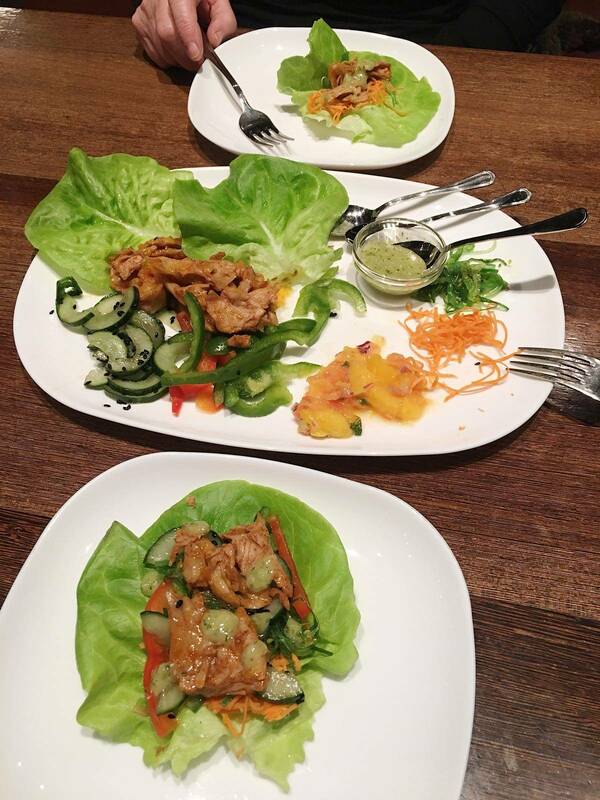 To start us off, the waitress suggested we try the Factory Salad Wraps (4 pieces: 1,795ISK / 8 pieces: 2,495ISK), which I actually glazed over, not even noticing there was a vegan option to have it served with Oumph!, as well as: cucumber, bell peppers, carrots, Icelandic pot barley, mango salsa and lettuce leaves for the wrap. 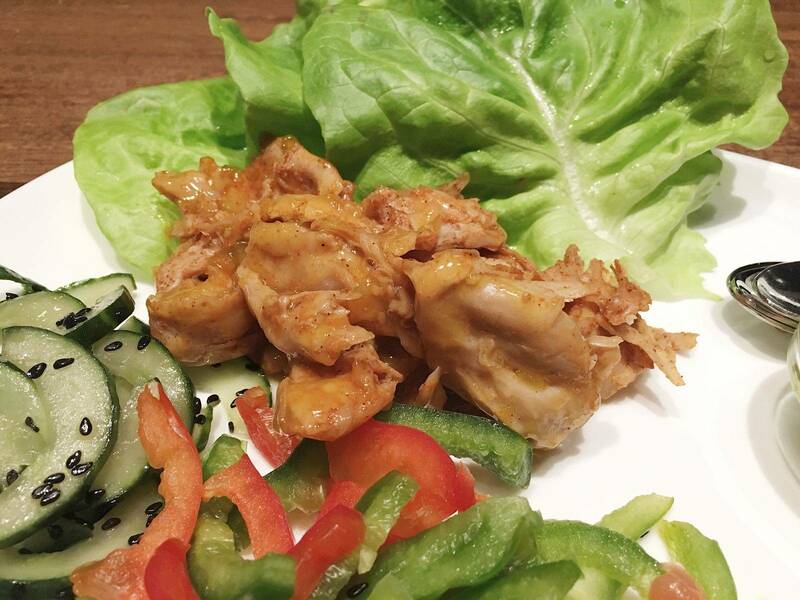 This was one of those “build it yourself” type dishes, which was a nice warm up and nibble before the burger, and something I’ll be trying at home – such a snazzy prospect using lettuce leaves instead of tortilla wraps. The Oumph! flavouring was so incredibly delicious. Upon enquiring the waitress told us it was Mesquite sauce, which had almost a fruity flavour to it? I don’t think I had had it before then, but gosh it was delicious. On the menu there are a few suggestions of the best burgers to have vegan with Oumph! replacing meat. It was so clear and easy to read, in comparison to so many places in the UK where menus can be unclear and when asking questions staff sometimes know very little. I’m hoping other places follow Hamborgarafabrikkan’s lead and add “out with” / “in with” sections followed by a list of food items for clarity. Especially those restaurants that make a point of being able to cater to those with dietary requirements. There was also a section on the menu purely for dips, two of which were very obviously vegan. And I’m not talking about salsa, or hummus… This was vegan regular & chilli MAYO (495ISK each), and they weren’t stingy with the portions either! What a dream. As my main I chose the vegan version of the Rescue (112) burger (2,495ISK) – served in a sesame bun (as opposed to brioche) with regular french fries, as well as some vegan chilli mayo on the side for good measure. 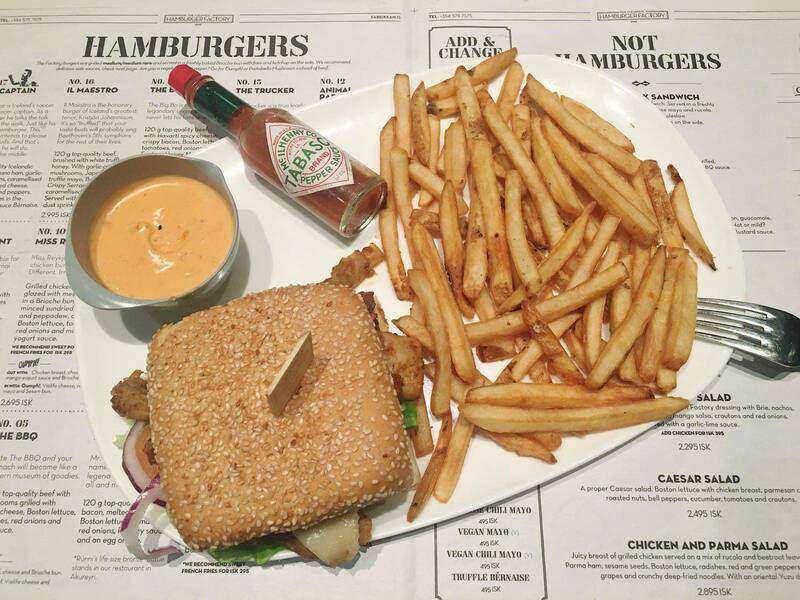 I’m quite a fan of spicy food, and I loved that in case the burger wasn’t spicy enough, it was also served it with a mini bottle of Tabasco on the side*! The other fillings in the burger were jalapeños, green and red chillies, mesquite sauce, lettuce, tomatoes, red onions, and cheese (Violife if you opt for the Vegan version). *Named after the emergency number in Iceland, the tag line of the burger is: “despite its immense power, the Rescue (112) is not a dangerous hamburger. But we do advise you to be careful.” – that’ll be due to the spiciness then! 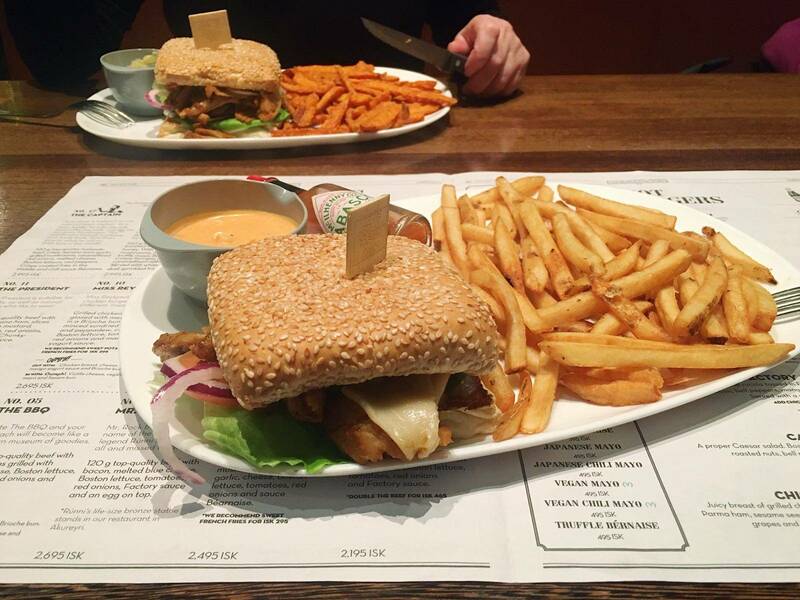 My mum chose the Miss Reykjavik burger (2,695ISK) – served in a sesame bun, with sweet potato chips (+295ISK) on the side, as well as some vegan mayo for dunking. The other fillings were sun-dried tomatoes, peppadew, lettuce, red onion, mango salsa, and Violife cheese. I had a bite at the time (as well as during lunch the next day as we had some leftovers) and the flavours were so lovely together. It was mild, without being bland. The Mango salsa and sun-dried tomatoes added a sweet and fruity edge to the burger which hugely complimented the Oumph! pieces. Following a successful evening trying a delicious selection of food, this will definitely be on my list to visit again next time I’m in Reykjavik (in the next few years I hope). Both the starter and our burgers were filling, and so flavoursome in their own ways. Having tried Oumph! already back in London at the launch event I was hugely looking forward to trying it in a burger, and I wasn’t disappointed. We had such a lovely evening at the restaurant, with excellent speedy service, and the food was just delicious. I’m truly surprised you can get Vegan burgers in Iceland (when it’s known to be such a meat heavy country) that are this good. Check out the full Hamborgarafabrikkan menu on their website here. If you’re looking for something a little closer to home for now, check out the Vegan tab on my blog for tons of delicious places to eat around UK! This meal was provided free of charge by Hamborgarafabrikkan in exchange for a blog post. However my review is an honest reflection of my experience. This was my first taste of “oumph” and I was delighted. There were especially delicious combinations of flavours within the dish – mango additions always attract my attention – it was fabulous – even to a non-burger eater! Menu details and staff knowledge should be a lesson to UK places.